Dynafit is coming out with a new line of light weight touring boots for next year. I was lucky enough to procure a pair of the TLT 5 Performance Carbon boots for a little test run last week on a tour with Bruce Edgerly from Backcountry Access (Look for a Tracker 2 review soon). There are three models available for next year the TLT Race (lightest), TLT 5 Performance (middle weight), and TLT 5 Mountain (Heaviest if you can call it heavy at all. The basics are this is a Dynafit compatible two buckle boot made of Pebax body and a carbon cuff. A single boot in size 27.5 weighs 2lbs 6.5oz (4lbs 13oz a pair). While not the lightest boot on the market it feels featherweight compared to my 4 buckle Titans. It comes with a heat moldable liner with a unique touring hinge in the back (Think of taking all the stiff foam out of the area by your Achilles tendon). So what are the latest and greatest features, and do they work. The first thing you notice is there is no normal lever for the walk and ski mode. 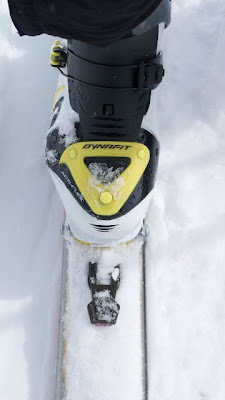 Dynafit has ingeniously created a way to integrate the top buckle into the tour and ski mode. When the top buckle is open you are in tour mode and when it is closed you lock into ski mode. This little detail saves a fair amount of time compared to my Scarpa F-1s. The boot is sleek and is a welcome sight for lower volume feet. The outer Pebax shell is formed for a snug fit even with a thin liner. If you have a high volume or high arched foot this may create an issue, but you will know when you try it on. The next feature is a removable tongue. While this is not a new concept it is certainly the first time I have used one that you can put into and take out of your boot easily. Simply open the 2 buckles and you can slide the tongue in or out. I took the tongue out for going up and put it in for going down. You can also simply leave the tongue at home if you don’t want the extra stiffness for the descent. While tour modes have been around for a long time. 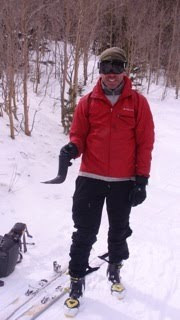 The TLT 5 Performance is the first boot where my body was the limiting factor in how far I could stride while skiing. The boots feel like you are wearing sneakers with a taller cuff. 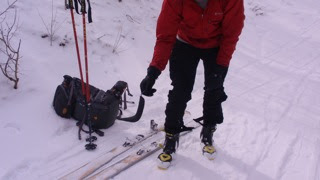 Instead of seeing if the front of my binding comes to the other ski tip for a long stride, I was usually at the middle of my foot to the other ski tip and I am not flexible enough to get it further. The boots skied really well downhill for a light touring boot. In fact I would say when I purchase a pair next year there will be a great deal on my F-1’s. I am looking forward to the opportunity to really give them a try on multiple tours and perhaps even in the Cosmic Randonee Ski Mountaineering Race series (http://www.ussma.org/cosmic/) this coming spring. I look forward to seeing everyone out in the snow and please let me know if you have any questions or comments. Any thoughts on how to size them? Since their shells supposedly fit much closer to the foot, would you go up a shell size? Did it seem like the liners would be too thin and cold? 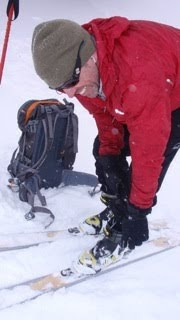 It's about time that boot manufacturers gave consideration to the fact that real ski touring involves going uphill and across flats... not just boot-hiking from a lift area. Also very glad to see a reversal of the stupid trend towards ever more useless buckles. What other AT boots is the foward flex comparable to in downhill mode? Hi, I am really interested in this - I doubt whether I will see them in Australia to try on though. I have a question about fit, not sure whether you can answer it but worth a try. How close is the fit, and width in particular to a Dynafit Zzero boot? I am sking Zzero 4s in a 28. They are wide enough but only just. Can I be confident that a TLT5 in a 28 will have enough width for my foot? I am not too worried about other measurements which are not as tight to start with for me. Pieps Dsp? It's really nice as far as avalance beacons go. I live in Ohio and just got a chance to use mine last weekend and love it! How different is the stiffness for the downhill compared to the Titan. I currently ski the Zzero 3 and feel like I can't let loose on the downhill. Conversely, my buddy on Titans rips. I'm willing to sacrifice weight to enjoy my descent more. But if I can get the best of both worlds with the TLT 5 I'd go that route. Your thoughts? i have a pair of those carbon boots and they rules so hard, where did you buy this stuff? tell me something, I want to practice this sport someday, but I don't know where! so please recommend me some good places to go, beside Aspen, Colorado.